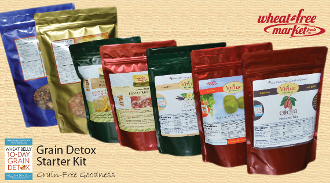 This easy product bundle is your companion to starting your grain-detox journey. It includes our popular Classic Granola and Slow-Toasted Flakes "Cereal," Virtue Sweetener, Wheat Belly Pizza Crust Mix, Wheat Belly All-Purpose Baking Mix, and both our Cocoa and Vanilla Prebiotic Mixes. Be sure to check out the Recipes tab on our home page for great recipes using Virtue Sweetener and the All-Purpose Baking Mix. You will find that enjoying a grain-free pizza during your first days of detox reminds you that this lifestyle doesn't mean you have to forgo many of the foods you enjoy. And the Virtue Prebiotic mixes will get you on your way to nourishing bowel flora by getting prebiotic fibers in a great-tasting way!